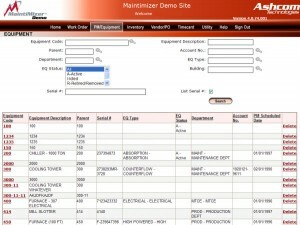 "Computerized Maintenance Management System" is a computer software program that assists maintenance teams to track all assets they are responsible for including scheduling maintenance and maintaining historical records of the work performed! There are some differences between these terms, they share a fundamental set of features that can be used in very similar ways. Starting as a Work Request, then becoming a Work Order, and finally, a closed Work Order, tracking maintenance activities from beginning to end is an essential part of any CMMS. Work Requests are submitted by non-maintenance team members such as line operators in a manufacturing operation or nurses, teachers, tenants, support staff in facility-based operations. When a Work Request is accepted it becomes a Work Order describing an issue and is assigned to a specific technician or class of technicians to do the work. When the work is completed, the responsible technician creates notes about the work performed, marks the Work Order "complete" and the manager and requestor are notified that the work is done. Most cars today remind you when it's time for an oil change; Maintenance teams need reminders too! CMMS software allows you to schedule recurring work or Preventative Maintenance tasks that need to occur at given intervals. Take it a step further and schedule the workload by job classification or specific maintenance personnel, making sure the workload is distributed evenly and the tasks are completed and not forgotten! Equipment, assets, machines--whatever you call them, are staples in any operation. Keeping records of past problems, fixes, and upkeep are essential for successful maintenance teams. CMMS solutions archive an asset's entire history in one easy to access place. Repair work completed? 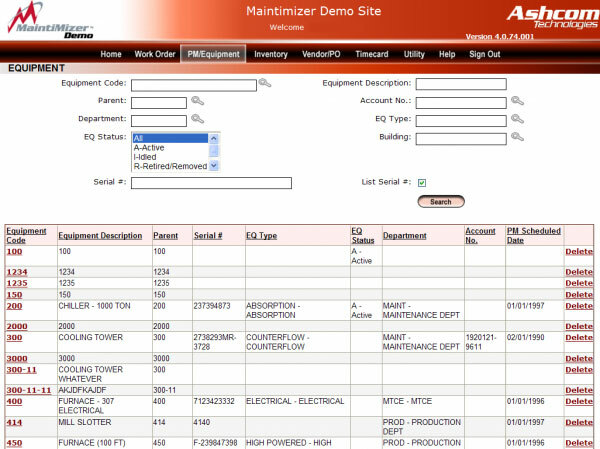 Details are recorded in the asset's history log and can be viewed again by workers. This saves time and energy and gives technicians information about past experiences to help solve problems. Tracking large lists of supplies including spare parts for machines and supplies like oil and grease are important for maintenance departments to keep costs down. CMMS software shows how many items are in storage, what items were used for repairs, and when new ones should be ordered. Inventory management saves money by pre-planning purchases allowing users to price shopping for the most savings instead of last-minute purchasing. Many CMMS solutions keep a record of every action that occurs in they system. This centralized record is not editable, creating an audit log of an asset's maintenance history. This log is useful for several applications including; accident or insurance claims - an inspector can verify if the proper maintenance was completed on a machine; for ISO certification; getting LEED certification - keeping track of regular maintenance of HVAC systems. What Does a CMMS Looks Like? Where do You Install CMMS Software? There are two common places where CMMS software is housed: on a computer or server at the client's business, or on the web. When a business is responsible for running its own CMMS, it is called on-premise CMMS. The benefit of this kind of installation is full control of the network access to the CMMS server, and complete privacy of the data (relevant for defense contractors, for example). The drawbacks are that this is expensive: the IT department has to be constantly looking after the server. Also, backups have to be done by the maintenance team and are often forgotten. Finally, the software can quickly go out of date if updates aren't regularly installed. When the CMMS runs online, it is called a Software-as-a-Service CMMS. Here, the CMMS company takes care of all the IT, hosting, security and backups for the system. The system can be accessed through any computer with a browser like Internet Explorer - no extra software is needed on the maintenance person's computer. Another strength of a SaaS CMMS is that new software updates are constantly applied to the system, the client is always using the latest version. The drawback of having your CMMS hosted by someone else is that you can use the CMMS only as long as the internet connection is working. Also, it is important to use a SaaS CMMS that lets you export the information in your system so that you can migrate it if needed. Fewer Work Outages: preventive maintenance is easier to manage, minimizing unplanned asset breakdowns. Better Accountability: know when work is completed and by whom, increasing the transparency of your maintenance department. Less Overtime: by utilizing the scheduling component of your CMMS you can schedule better; less idle time, even task distribution among staff, and less overtime pay. Information Capture: record problems and solutions in the CMMS, a tool everyone has access to, not just in an experienced staff members head. Savings on Purchases: inventory planning features give you the time to shop around for spare parts--finding the best price, instead of having to rush a purchase at top dollar. Certification & Analysis: a full record of assets, including performance and maintenance, helps managers manage maintenance team performance and compliance. Production Maintenance - these are companies that make things, manufacturers. They have machines, assembly lines, forklifts, and heavy equipment to take care of. Facility Maintenance - these are companies that take care of buildings. Hospitals, schools, hotels, and government buildings all require maintenance, and CMMS software helps them maintain structural, HVAC, and plumbing problems. Fleet Maintenance - these are companies that take care of vehicles. Transportation companies , delivery companies, and fleets of trucks all need scheduled maintenance and repairs when needed. CMMS solutions can help companies maintain their vehicles for safety and profits. Mobile CMMS Applications Ask around and most maintenance workers will tell you they don't spend a lot of time in the office. They're out fixing machines or taking care of buildings. Being able to access CMMS data or enter it out in the field via mobile phone or tablet makes their jobs much more efficient. Easy to Use CMMS Many CMMS products on the market are difficult to use and don't keep the end user in mind. Choose a CMMS product that is simple to navigate and use so that even the most novice computer user can get their work done. Fast CMMS Data Entry The majority of CMMS projects fail because it is labor intensive to set up the application and create all the assets/buildings, record all inventory, and set up Preventative Maintenance Work Orders, SOP's, and everything else the maintenance team needs to input BEFORE they start using the CMMS solution. At Ashcom Technologies, we have a team of experts ready to help move your existing data into the MiantiMizer system, helping you start off on the right foot.